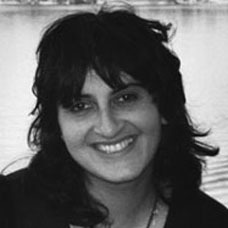 Moniza Alvi was born in Lahore in Pakistan, the daughter of a Pakistani father and an English mother. She moved to Hatfield in England when she was a few months old. She didn't revisit Pakistan until after the publication of her first book of poems - 'The Country at my Shoulder' – in 1993. Alvi's sense of uncertainty about her personal identity as a westerner conscious of a non-western heritage that she can only partially connect with is a feeling that many people in international schools can understand. Like many students, Alvi is almost childishly preoccupied with the question: Who am I? The word "my" is one of the potent ones in her poetry: it reflects the poet’s assertion of her identity while at the same suggesting a desire to know her past and her heritage more fully so that she can come to a better understanding of herself. She says: "I found it was important to write the Pakistan poems because I was getting in touch with my background. And maybe there's a bit of a message behind the poems about something I went through, that I want to maybe open a few doors if possible."